I have an Austrian princess on the brain. She’s in my head, singing me songs, diving through my closet and crawling out of my handbag. She’s everywhere, and I might as well get used to it. I’ve been immersed in Caroline Weber’s Queen of Fashion – What Marie Antoinette Wore to the Revolution for weeks, and now I’ve seen what all the fuss is about: Sofia Coppola’s film Marie Antoinette. Like that other sumptuous period drama of a few years ago about a big boat meeting an iceberg, we all know how this movie is going to end. Yet who knew it would be done with this exuberance, decadence, and style? For a brief few seconds in the opening credits, you’re treated to the ultimate summation shot: la reine, in dishabille, coiffured with an extravagant pouf, having her new pink shoes put on her feet as her fingers dive into a gigantic pink cake. Cakes, coiffures, shoes, and pink. The end. While Caroline Weber’s book paints a more realistic portrait of the misunderstood queen, the confection on film is much more fun to endure. Barring a few slip-ups in casting and cut-aways, (do we really need the fantasy shot of Count Fersen on a rearing horse? I mean, he’s hot, but that’s a bit heavy-handed Mademoiselle Coppola…) the entire thing is a gluttonous delight of striped nosegay silks, little dogs, glittering gems, ruffles, ribbons, and feathers. A whole film of not a whole lot, but when it looks this good and is set to a soundtrack of punk rock, who cares? The crowning achievement of this film is that it was filmed at Versailles. Once one visits that indulgent place, one sees exactly what the revolution was all about. The immediate impression is that someone simply went to town on the gilding of every surface, while the slow-to-apprehend reality of Versailles is that there is practically zero private space anywhere in the entire monstrosity. This is what Coppola captured: the wedding night and later childbirth in the queen’s bedroom absolutely packed to the rafters with people. Imagine that – two of the most intimate moments of your life, and there you are on display for people you don’t even want to talk to when you have your clothes on. The procedures, the protocols, the honors of the toilette – Marie Antoinette was said to have hated all of this pomp and formality of Versailles, preferring the casual informality of her native Hapsburg household wherein she could dress herself. Caroline Weber’s lengthy tome discloses all of the ins and outs of Marie Antoinette’s sartorial evolutions. Newly-invented styles turn into maddening fads among the aristocracy who ape the queen to their own financial ruin. A few years later, the queen’s fashion choices lead to her derision and downfall. It’s a familiar story to those of us who know the history of lady politicos. A later French queen (since the French can never decide if they want one or not,) Empress Eugenie, was nicknamed “Empress Crinoline” because of her clothes-horse ways, while years later women such as Eva Peron, Jackie Kennedy, Imelda Marcos, and even Nancy Regan were derided for their closets-full of excess. But Marie Antoinette is the woman whose indulgences taught everyone else how it’s done, the singular point brought home by Coppola’s film. 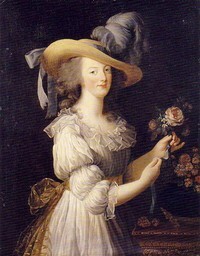 The film’s tagline of “The party that started a revolution,” is indeed true: much of the film is devoted the party Marie Antoinette is having while she spends years simply waiting for her husband to touch her. Once the Versailles party of the century begins to wane however, Coppola’s film accelerates and tends to overlook the ravages the queen faced late in life, not to mention the ravages of all-night parties. According to Caroline Weber, the fresh-faced girl that had arrived in France had gained a hardy amount of weight due to finally delivering three children, and had also lost the better-part of her hair. These physical manifestations of the stress of life at Versailles are glossed-over completely, and well they should be in order to keep pace with the film. However, the woman’s life was no fairy tale, so the ending pathos in the golden dawn is lost on most of the audience – we never really bought that it was all fun and games anyway. Despite its little fumbles, Marie Antoinette is my new favorite film, and I’m already pre-ordering the DVD from Amazon. I’m a sucker for a costume piece, and this is one of the most enjoyable I’ve seen in years. Perhaps because real life for la reine Marie *was* such a costume-drama, the frothy interpretation in film cannot rightly be classified as a guilty pleasure. A pleasure it is, but who is guilty of enjoying it? It brings a smile to your face, quickens your pulse, and makes you want to paint the chateau pink.